The Valley Metro Regional Public Transportation Authority (RPTA), operating out of Phoenix, Arizona, has exercised options to purchase 24 additional Xcelsior® forty-foot, compressed natural gas (CNG) heavy-duty transit buses from New Flyer of America Inc. (New Flyer), a subsidiary of NFI Group Inc. 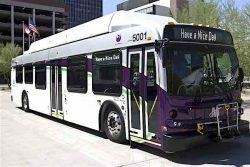 The order will replace older buses currently operating on regional routes in support of Valley Metro’s 2016-2020 strategic plan to advance the value of transit throughout the metropolitan Phoenix area. The original contract awarded November 2017 (a joint effort with the City of Phoenix Public Transit) included up to 396 buses over a five-year period, and is supported by funding from both the Federal Transit Administration and local sources. Seventy percent of the Valley Metro fleet are powered by natural gas to support local clean air initiatives.